Fibroids usually do not require treatment because most patients with fibroids do not have symptoms. 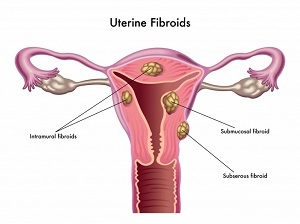 Women with Uterine Fibroids should have regular checkups to determine if the fibroids are changing in size, to track worsening symptoms, and if planning to get pregnant. If treatment is required, does that mean surgery? Since some Uterine Fibroids are affected by estrogen levels, medical management of uterine fibroids may help temporarily but will not improve fertility. Medications that are used may be associated with undesirable side effects. These medicines include gonadotropin-releasing hormone (GnRH) analogs (hot flashes, vaginal dryness, mood changes, osteoporosis), birth control pills (breast tenderness, blood clots), progestins (bloating, abnormal bleeding), and adrogens (unwanted hair growth). Alternative approaches such as herbal and homeopathic therapies have not been shown to improve symptoms caused by fibroids. What surgical options are available if I desire future fertility? The only surgical option available to women who desire to get pregnant in the future is a myomectomy or surgical removal of the fibroids. 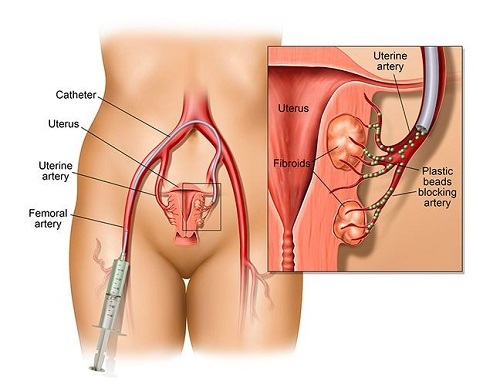 In most cases, the size and location of the fibroids will determine the appropriate surgical technique. How is myomectomy performed? Is there a minimally invasive approach? With this method, the surgeon makes an incision in the abdominal wall. It is most commonly used to remove tumors on the outer surface of the uterus and surrounding organs. This surgery usually requires a 24 to 72-hour hospital stay and 4-6 weeks’ recovery. During operative laparoscopy, the doctor places a laparoscope into the abdomen through a small incision near the navel and then uses surgical instruments placed through small 5-10 mm incisions to remove the fibroids. Women can be sent home from the hospital the same day or within 24 hours. Recovery time is usually two to seven days. to remove submucous fibroids. Generally, women are sent home the same day as surgery and can return to their normal activities within a few days after the procedure. 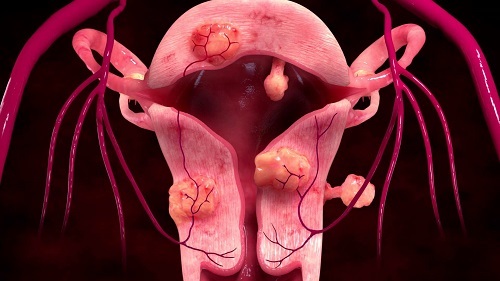 Serious complications are uncommon and include damage or scarring to the inside cavity of the uterus, electrolyte imbalance (changes in the minerals in the blood system), puncturing the uterus and bleeding. During a robotic procedure, a doctor places a telescope into the abdomen at or above the navel. Up to five other small incisions are made to hold the instruments to remove the fibroids. Women are typically sent home from the hospital the same day or within 24 hours. Recovery time is usually between a few days and a week. What is the chance after a myomectomy that the uterine fibroids will return? What are other options available if I do not desire fertility? A method which does not involve an incision is called MRI-guided focused ultrasonic treatment (MrgFUS). As this is a relatively new technology, there is limited information about long-term outcomes. At this time, MrgFUS cannot be recommended for women hoping to maintain or improve their fertility. Uterine artery embolization is a procedure performed by a radiologist that involves injecting small particles into the uterine blood vessels. These particles clog the small blood vessels that supply the fibroids, impeding the blood supply and causing these fibroids to degenerate. Patients generally experience several days of pain after the procedure. Fibroid volume shrinks by 40-50%, and the majority of patients experience symptomatic relief. At this time, it is not recommended for women desiring future fertility and pregnancy.